I feel that my living close to nature gave me an interest in Native American teachings, but, after 12 years of focusing on these teachings, I had to look at the other parts of myself and make peace with my European Christian ancestors. This came to me through another vision, this one on the top of Mt. Shasta in 1990. I was 38 years old. This vision changed the course of my life, and a new direction came to me. Battles were being waged over the fate of Mt. 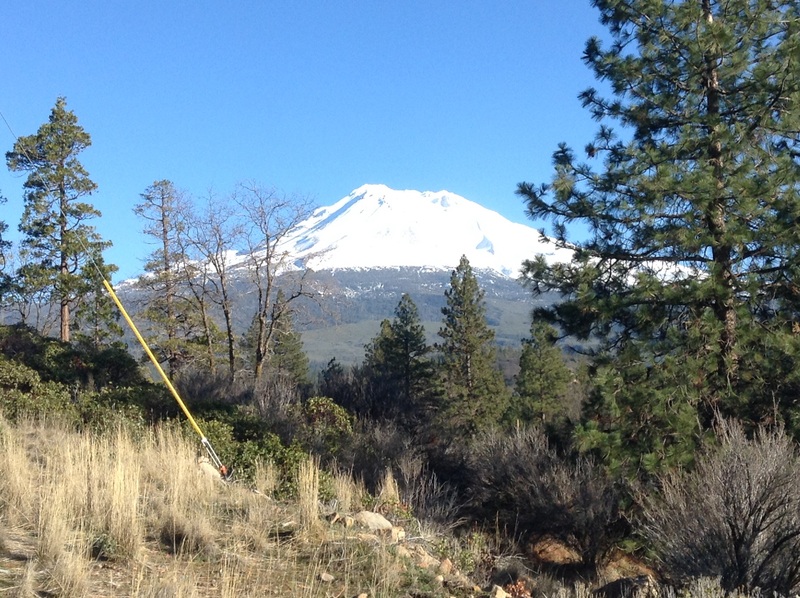 Shasta, between developers and environmentalists. The Native American people saw the mountain as their sacred shrine. Environmentalists viewed the mountain as a pristine place in nature worthy of preservation. The New Agers saw it as site for pilgrimage toward spiritual understanding. The developers saw it as virgin timber, money to be made, condominiums, a ski resort. Everyone had his viewpoint. I had been away from the mountain (and the city of Mt. Shasta) for seven years-once it had been my home and sanctuary. The first night staying on the mountain, I was wakened by the mountain’s trembling under my sleeping bag. I felt the earth really shake. I sat up, addressing the spirit of the Mountain, saying, “Wait a minute! I am here to help.” To say the least, I was scared. The next morning the filming began and, to my surprise, I realized how many more people had been coming to Mt. Shasta than in my past. I witnessed the thoughtless trampling of the plants in the fragile meadow environments. “Spiritual graffiti” was strewn everywhere-medicine wheels constructed to the point that cement had been used so they could not be moved, sage sticks thrown like chewing gum wrappers. The spirit of the Mountain was not happy. This was a sacred place for the native tribes, and was visited once or twice a year as a pilgrimage. Even though I am sure the other visitors had good intentions, the scene was littered with spiritual trappings. I remembered, in contrast, the first time I went to a sweat lodge on the Mountain when, after the ceremony was done and the prayers were said, the Native American ceremonial leader stressed that we clean everything up completely so no one could tell that anything had happened there. The fire pit was buried, the sweat rocks were placed naturally into the environment, and even our footprints were brushed out with fir boughs. Anyone passing would never have known that prayers and a sacred ritual had taken place there. Well, to say the least, things had changed in seven years and the Mountain was feeling the effects. I went to a freshwater spring that I knew of and sat there noticing how many precious little plants had been trampled by the unconscious feet of fellow travelers. I felt the Earth cry. I began to meditate, and naturally moved into a vision state. This vision set my feet upon a new pathway, which went back-into the history and the understanding of Christianity. Love the questions, and the journey to answer those questions.